That evening. After the Annual Perennial. After that craziness. When I tense and angry and emotionally drained, but still had to design new soap labels, I took a warm bath with Valerian and Yarrow. 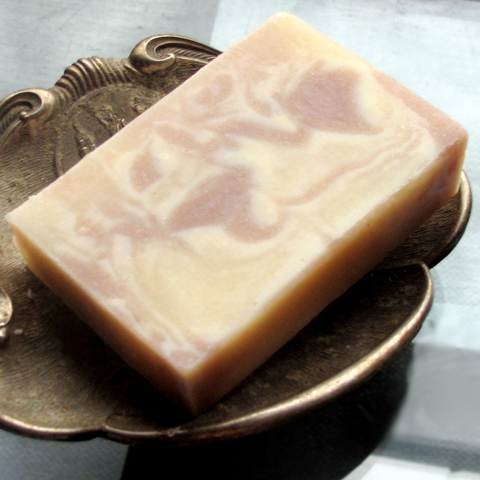 The secret to making soap with valerian root is not to grind the root into a powder for the infusion. Valerian root stinks. I think it smells like rotting dog feet. I don’t want specks of its stinkiness in soap. I keep the root in chunks. It doesn’t add any color, so I also added yarrow to the olive oil and I used a smidge of purple clay in part of my batch for a pale, calming swirl. Other than that, it’s just a regular recipe with my favorite valerian essential oil blend at trace. Amazing how the process of steam distillation can turn something fetid into something aromatic that’s been used in perfumes since the 16th century. The finished soap smells fantastic. Clean, fresh with just a hint of spiciness. It’s the kind of soap that you keep picking up as it’s curing to get a big whiff. And just the ticket to unwind after a crazy day.